Pieces of Love 4 Jeremiah! Pieces of Love for Jeremiah! Welcome to Peices of Love for Jeremiah! 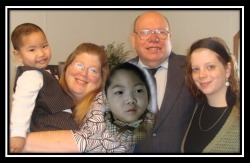 This is our site to follow the progress of our puzzle for Jeremiah and raise funds to go to Taiwan and get him. Jeremiah Harold Sisemore is a 2 year old boy with Severe Cerebral Palsy and Visual Dysfunction waiting in Taiwan for us, The Sisemore Family, to come and bring him HOME forever to be our son. Jeremiah is lovingly known as Frogie Boy! He got that name becuase we have had to Fully Rely On God In Everything to do with Jeremiah's Adoption. Our puzzle peices are sponsored for $2 a piece! Please sponsor a piece of the puzzle and help us bring Jeremiah home! To follow Jeremiah's journey home and through life please visit our family blog www.tillGodbringsthemhome.blogspot.com :) God bless you for helping our family!